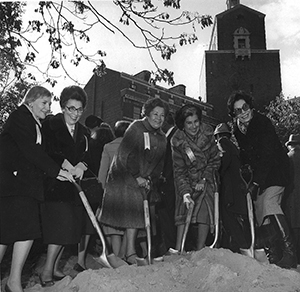 Seminary Library groundbreaking: Women’s League presidents Evelyn Auerbach, Evelyn Henkind, Helen Fried, and Goldie Kweller, with Dr. Naomi Cohen. We all know the story. On January 18, 1918, the diminutive, but commanding, Mathilde Schechter stood before a gathering of 100-plus women and called for the establishment of a national women’s organization of the United Synagogue of America. Every year on the Shabbat nearest to that date in January, we commemorate our remarkable founder for whom our reverence remains steadfast. For some of us, other names besides Mathilde’s also come to mind: Fanny Hoffman and Goldie Kweller and Adele Ginsberg and Helen Fried, each a legend in her own right. 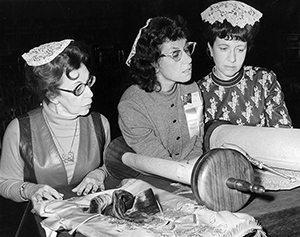 Torah Reading at 1972 Women’s League convention: (left to right) President Evelyn Henkind, Education Director Edya Artz, and Ruth Perry, Convention Coordinator. So as we approach our centennial year, its celebration to begin at the 2017 Convention in Washington, D.C., we are looking to the past as a very practical guide for our future. Our work is our standard. It has sustained and defined us for nearly 100 years. The first generation of National Women’s League members was like an army of peripatetic teachers spreading across the continent, teaching a largely uneducated population of East European immigrant women about the most basic aspects of Jewish life: Bible, prayer, Hebrew language, Zionism. In the first decade, they produced a bevy of educational resources including Kiddush cards, Friday Night Stories, Blessing and Daily Prayer cards, and in 1927, Deborah Melamed’s The Three Pillars – Thought, Worship, Practice. Serving as a handbook of Jewish literacy, The Three Pillars was the first work of its kind published in English. Despite the pessimism of publishers that there was no market for such a volume, that first Women’s League publication went through numerous editions, maintaining robust sales even through the Depression. In 1930, the League established its own magazine, Outlook, featuring Mathilde Schechter on the cover of the first issue. 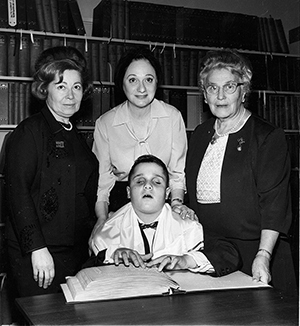 Bar mitzvah celebration at the Jewish Braille Institute, November 1964: Women’s League president Helen Fried, mother of the bar mitzvah, and Women’s League Braille Chair Adele Ginzberg behind the bar mitzvah. Throughout the decades, members of Women’s League participated in an extensive array of social/political initiatives, within the Jewish community and beyond. In 1924, the American Peace Committee awarded the Bok Peace Award to National Women’s League in recognition of its Education for Peace program. During World War II, under the steady hand of President Dora Spiegel who served from 1928-1944, members participated in the war effort as air raid wardens, switchboard operators, ambulance drivers, and organized mobile kitchens and blood units. They worked tirelessly on behalf of the Yishuv (the Jewish community in pre-1948 Palestine) and then for the State of Israel. They advocated and marched on behalf of civil rights, Soviet Jewry, women’s reproductive rights, and genetic disease awareness. Scores of readers created records and tapes for the Jewish Braille Institute and joined walks in support of breast cancer research. Also from its very beginning, Women’s League provided crucial financial support to the Conservative seminaries and their students. Its first project in that first decade was the Kosher Canteen at Columbia University, and then the Jewish Student House for seminarians and Jewish military passing through New York. Through contributions to the Torah Fund campaign that began in the mid 1940s – which to date has raised more than 93 million dollars – JTS was able to build the Mathilde Schechter Residence Hall, rebuild the library after the devastating fire, and the Women’s League Seminary Synagogue. In addition to JTS students, Torah Fund scholarships are now awarded to students at the Ziegler School of Rabbinic Studies, in Los Angeles, the Schechter Institute in Jerusalem, and the Seminario in Buenos Aires. 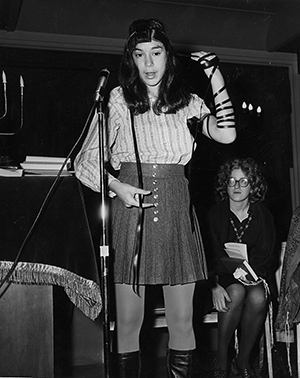 1972 Women’s League convention: Ezrat Nashim’s Leora Fishman demonstrates how to put on tefillin. Not the least among its enduring legacies is Women’s League’s participation and support of Jewish feminism. In 1972, after Ezrat Nashim was rebuffed by the Rabbinical Assembly to attend its convention, Women’s League invited the pioneering Jewish feminist group to present their platform at its biennial. Women’s League members led their own Torah reading for the first time (previously done by men at conventions) and Ezrat Nashim’s Leora Fishman demonstrated how to put on tefillin. This revolutionary transformation in women’s religious practice resulted in widespread liturgical literacy for thousands of members and eventually led to the ordination of women rabbis in 1985. It bears repeating: these activities and initiatives may have been envisioned by Women’s League leaders, but the footwork and heavy lifting was (and remains) the product of its members. Whether 15,000 knitted hats and scarves for the homeless in Detroit, funds collected for Masorti kehillot in Israel or a deep bench of qualified Torah readers and shlichot tzibbur, it is our work that has defined us, sustained us, and binds us to the past, but focuses us, always, on the future. As one who enjoyed the original Outlook, I am pleased that it is being revived in this new format. I REALLY enjoyed this issue, as I knew and worked with all the women on pages 4 and 5, except Donna. Also, one of the conventions I attended is the one where we voted on whether we thought women should be ordained as rabbis. I edited the Handbook for one convention and the Proceedings for the next one with the help of Etta Kamsler. This gives me such pride in Women’s League. Glad to see my mother’s photo. She was always proud of her work with Women’s League! Loved the recent New Outlook. Many years ago, when I was sisterhood president (1960- 1962) and for many years after that, I looked forward to each issue of Outlook. But this recent one, and this article especially, brought to mind a wonderful occurrence that really enhanced my life. Way back then, sometime in the 1960s, I attended a National Women’s League Convention at the Concord Hotel in the Catskills. I was looking for a project for my sisterhood … One of the programs offered was on Braille. It fascinated me; imagine being able to help the blind read Torah or even just read! I was determined that this would be a great project. On my return, I contacted the local association for the blind. A few weeks later they sent me a representative to talk to my board about learning Braille. I thought I’d start the project there. I had a huge board of almost 35 members. To a woman, they all signed up to take the course. When the time came, four showed up and then only one woman finished the course. It was…. but that’s another story. When I finished the course, I became a certified Braillist through the Library of Congress. Although I never learned to Braille in Hebrew, I did Braille for the local school system for over 10 years. Then when I relocated to another city, I continued to Braille for several students at a local college as well as several people in the community there. Unfortunately, when I returned to Charlotte, NC, I was told that my services were no longer needed as Braille was being done electronically. There is no question that thanks to the program at the convention 52 years ago, my life became enhanced by being able to do something that would help others. All this experience came flooding back to me after seeing that picture for the memory of that time long ago.